Our Hanga Treasure Chest is now just over 1/4 full; I wonder if the selection of prints is anything like what you had expected to see! We haven't had any 'big name' designers yet, so perhaps it's time to include a print from somebody you will recognize. Katsushika Hokusai's name was another that frequently came in for such cavalier treatment; it is an endless headache for scholars to try and sort out which prints and paintings actually came from his brush, and which are imitations. Some years ago, I found a few fish prints in a dealer's shop, and although they were said to be by Hokusai, well ... we'll never really know for sure. One day next week we'll be celebrating 'Boy's Day', and as the Japanese carp is a traditional symbol of that festival, I thought I would use one of those fish designs I found. But it's not just the old-time publishers who could 'adapt' designs they came across - as there are of course no longer any copyrights applying to such old work, I too am free to borrow and re-arrange things as I see fit. So I 'transplanted' the carp from the bed of water plants that he was nestled in, floated him in space to give a bit of the feel of the 'koi-nobori' streamers we see around Boy's Day, and then added a background of sumi-nagashi pattern, just for fun. But I think I'll leave Hokusai's name off, as I doubt there is much of his work still visible, if any! 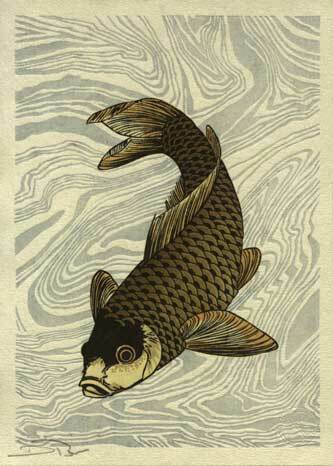 This carp seems just as effective now as when Hokusai originally designed it! I love that subtle bokashi which makes the body of the fish seem so round and golden! I was really quite surprised in the weeks after that print went out, to find out that there was a very large difference in the feedback I received from Japanese collectors and those overseas. Feedback from the Japanese side? Almost nothing. Silence. From the western side? Here's a comment I got in the mail: "Ohhhhhhh mygod that fish is gorgeous!!! I'm madly in love with this print. Thank you thank you thank you." And this is how it went ... letter after letter letting me know that "this is the best one in the series so far, by far!" You said there was silence on the Japanese side of comment. Maybe people in Japan are too accustomed to fish in their designs. Here in the U.S., unless we live on the coasts, fish aren't that usual, and you have made us look at this graceful one with its handsome color and dreamy water in a new way. This is why I like it. I can't find one thing about this print that I don't respond to. To me it's a perfect piece. The fish even looks like it's enjoying itself being a fish. This piece is quite beautiful. It is inspirational as well. It makes me want to sit down and do some printing (not that I will be able to come anywhere close but that is immaterial). Did you actually make the suminagashi paper? Or did you lift the pattern and recreate it using a woodblock? I am a co-founder of the society of marbling, and we are interested in all things related to the floating art. Are you aware of the two paenls by Harunobu that feature a suminagashi design? I wonder if these are truly suminagashi paper, or a woodblock print imitating the design. "Saruhiki" and "Mitate Kanzan Jyottoku"
It is not clear to me whether these are made from woodblock printing. It seems easier to me to just use a piece of suminagashi paper than to create a woodblock imitating the design. btw- I found your site using a google image search and the term "墨流し", which led me to your Japanese language site. Did you actually make the suminagashi paper? No ... this is a woodblock print. I carved the background design you see there, and it is thus the same on all the prints. It seems easier to me to just use a piece of suminagashi paper than to create a woodblock imitating the design. If you only want one copy, then sure. But if you need a few hundred copies, then it's much better to cut a block ... once ... then print it ... many times.